Q: Where can I see Greystones figures on display in the UK? A: Greystones Collectibles are an approved and authorised supplier to the National Trust for Scotland and Historic Scotland. 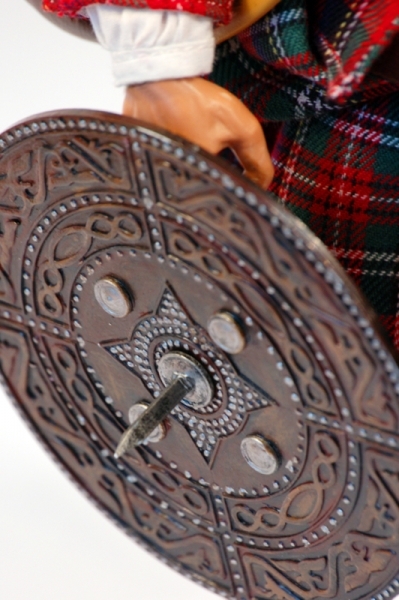 Both our 1745 figures can be seen and purchased in the Battle of Culloden Visitor Centre Shop, Drumossie Moor near Inverness and at Glenfinnan Monument Visitor Centre. Now at Doune Castle near Stirling and The Little House Museum, Gift Shop/Clan Centre, Bruar near Pitlochry. We have also appointed The Regimental Shop in Edinburgh and Treasure Bunker in Glasgow as our exclusive central Scotland retailers - www.treasurebunker.com or www.regimentalshop.com - call in to see them in person! Q: How do you get the super realistic look of the figure dressed and posed? A: This takes time and patience! As each 'figure' is yours to dress as you wish, we suggest you try and keep the clothing and accessories in positions as close to normal human-dress proportions as possible. 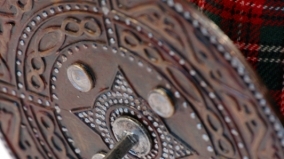 The Jacobite is quite a challenge as the 'plaid' needs special attention to detail of how it was worn. 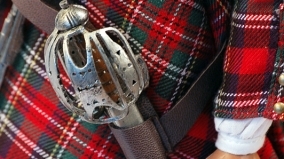 However, as the Highlanders didn't have a set uniform, you can wrap the plaid in whatever manner you choose, as long as it remains close to how it was usually worn. Refer to our photos - if necessary, unclip the shoulder clasp and re-position. If not planning to rework your pose by much, a little super glue, double sided tape or blue tack helps keep parts and clothing tight. If you really are struggling, send us an email or telephone us, we're here to help you enjoy your Greystones figures to the maximum and are always happy to help. Q: Do Greystones offer a 'dressing' service? A: Yes, we do. Let us know if you'd like us to 'prepare' most of the accessories fitted for you (belts etc) and we'll do this before we dispatch your orders. Our charge is a nominal £9.00 including VAT. A: Each figure is completed with all its components under very strict limited production. To maintain their exclusivity, no 'extra' parts are normally ever produced. 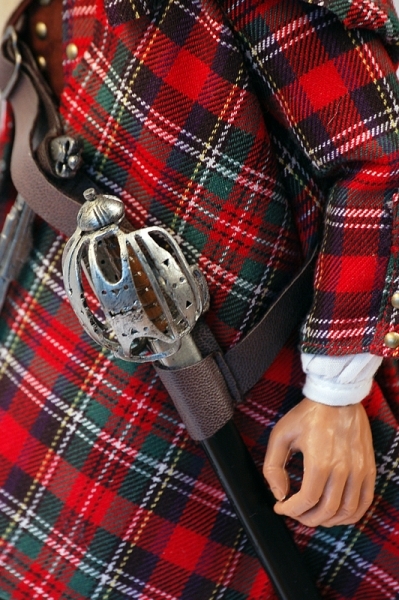 However, due to display stock being 'used', we have some spares available as follows: Jacobite - Shield: £12.00, Plaid: £18.00, Pistol: £7.00, Satchel: £7.00, Blue Bonnet: £9.00, Tartan Jacket: £18.00, Brown Waistcoat: £14.00. Redcoat - Hat: £5.00, Musket: £18.00, Hanger Sword/scabbard, Bayonet/scabbard, belt: £22.00. Payment by cheque or using a Paypal account to info@greystonescollectibles.com. Call or email us for details of all other items as stock changes frequently. Q: Why are most parts made in China? A: China produces the finest 1/6 scale figures in the world. Greystones worked in China with exclusive partners to develop each of our 1745 Rebellion figures to the highest possible standard. Final dressing, QC checks and addition of some specialist packaging, maps etc is still completed by Greystones personally in East Lothian, Scotland, United Kingdom. Q: What is the best way to display my figure? A: We recommend a display cabinet. This will protect against dust and keep small hands safely away from the delicate parts and accessories. Q: From what historic period will Greystones Collectibles next figures be based? A: We're working on one now from WW1 'The Great War' of a soldier from The Black Watch circa 1915 - see the photo on this page. This sample was created for us by the world famous Tony Barton of York, England. See Tony's incredible work at: www.antheads.co.uk. Now we are researching the 1:6 market to check if this design is of interest worldwide. All going well, we hope to have it ready for launch soon but please be patient, these things take time.